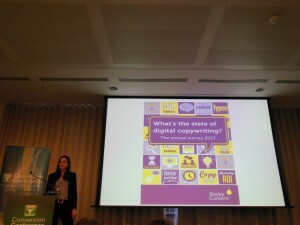 There were two great speakers talking about copywriting at Conversion Conference in London, Michael Aagaard and Catherine Toole. The first optimisation principle, is that it is not the magnitude of the change on the page that impacts conversion, but it is the magnitude of change. The second optimisation principle is that “clarity trumps persuasion”. How much of your copy will people read? Michael took us through the key areas that users read and where copy will have a huge impact. Michael gave an example of a client they worked with called Fitness World. “Group training and fitness at your local gym”. This led to over 40% more sign ups – just from changing this copy – what powerful stuff. We should not assume the most creative copy is the best copy to use. This is where clarity trumps persuasion. 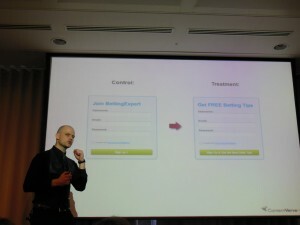 The most prominent part of the sign up form is the headline and changing this can have a big impact. The second copy resulted in a 31.54% uplift in sign ups. The new copy gives the customer a good reason to sign up. Motivation is a factor for people and this was reflected in the increase in sign ups. This is the low hanging fruit and ties the whole conversion funnel together. “Find your gym and get membership”. Result – there was a 213% increase in CTR. The result was a 31.47% increase in payments. For content optimisation, we need to know its purpose. Most digital copy writers say the best copywriting is in print. Very few people are creating content from a written brief. 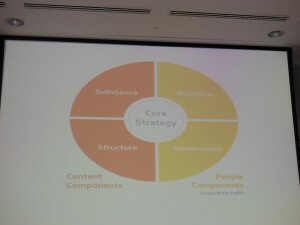 There was also very few people that have a content plan and those those that do, have this hijacked by business needs. How can you optimise content if you do not know what the purpose? Need to have the power to impose your power of the version of content. Within the organisation, it is important to have a good mindset over copy only testing (not images). Speak the language to the audience. About 2,000 new words and phrases were invented by Shakespeare. Know the power of words and how it resonates with your audience. This is the key to copy optimisation. Facebook realised this when they changed the “Become a Fan” button to the “Like” button. It is not just about the words, but the order of the message. Have the confidence to send out tone and voice. For example Twitter messages sounds like their brand even when users sign up to Twitter. Catherine talked about the example of Johnnie Boden, a clothes retailer who sound like their brand throughout their site. Short form copywriting is a craft. It is a very specific form of writing and takes time to do this in an expert way. Optimisation is more difficult than it may appear. Optimise all areas of your copy, even the unsubscribe copy. It takes a lot of practice to become a good copy writer, especially writing short copy. This was a fantastic session with some great tips about copywriting from both Michael and Catherine. Catherine highlighted the fact that copywriting is a skill and should be seen as that. Copywriting should be allocated the time and resource it deserves, so ensure you incorporate this into your online marketing strategy. Jo Turnbull also interviewed Catherine Toole, before the conference who shared her content tips with State of Digital.